The Security Devices pulling sets are used to lift and turn over devices that may be sensitive to movement or may be booby-trapped. Whenever there is any uncertainty about a device, it should be pulled before being handled. 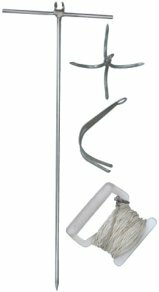 The "Standard pulling set" (SKU3021) is made using stainless steel, galvanising hooks and nylon cord. The length of the cord can be varied to suit your needs. The hook shapes and sizes are designed to allow small and large items to be hooked and then turned over remotely as shown below. The cord is played out until the holder can be at a safe distance or behind suitable protection. The cord passes through a guide on top of the stainless steel "T" bar, which acts as the pivot to lift the opposite side of the device. 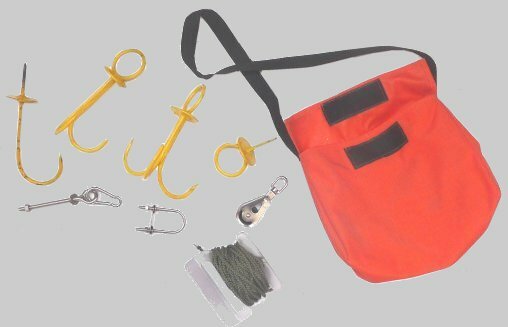 A more sophisticated "EOD pulling set" (SKU3022) is also available. Order by SKU numbers (SKU3021 or SKU3022).